The Pax gene family of nuclear transcription factors is comprised of nine members that function during embryogenesis to regulate the temporal and position-dependent differentiation of cells. The Pax gene family of nuclear transcription factors is comprised of nine members that function during embryogenesis to regulate the temporal and position-dependent differentiation of cells. In addition, the family is involved in a variety of signal transduction pathways in the adult organism. Mutations in the Pax family of proteins have been linked to disease and cancer in humans. 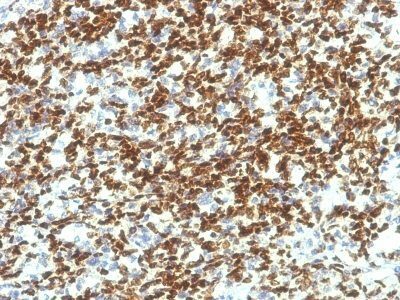 Pax-7 is a protein specifically expressed in cultured satellite cell-derived myoblasts. 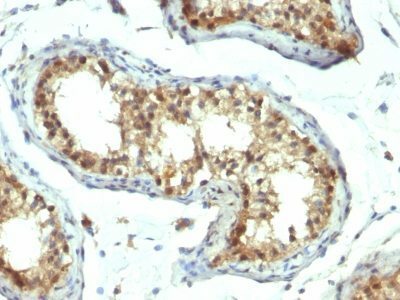 In situ hybridization reveals that Pax-7 is also expressed in satellite cells residing in adult muscle. A chromosomal aberration in the gene encoding Pax-7 causes rhabdomyosarcoma 2 (RMS2) (also called alveolar rhabdomyosarcoma). Catalog number key for antibody number 1187, Anti-PAX7 (PAX7/1187) The prefix indicates conjugation, followed by the antibody number and size suffix.